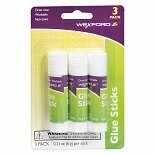 For school or the office, glue sticks can be an easy and less messy way to seal envelopes or secure paper. 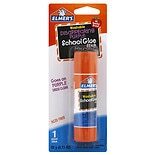 Most school glue can be washed off easily and can dry clear. 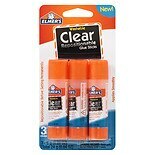 Simple to use, glue sticks from brands Elmer's and Penway are here at Walgreens.com for your crafting and other needs. 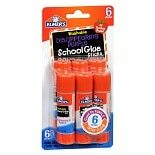 The fast-drying form of glue sticks means you won't have to spend time waiting for your school glue to set. 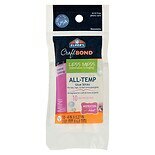 Use these glues for making posters, study cards or other projects that are helpful in school or the office. 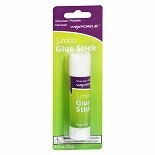 You can also use other all purpose glues such as liquid glue for repairs and making home decorations. For tougher jobs, choose a package of super glue that can adhere quickly and reliably. 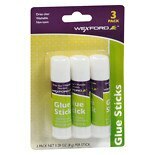 For supervised crafting, you'll find other adhesives and glue guns in addition to glue sticks here at Walgreens.com. Many types of tape are handy around the house, and glitter glue can add a unique touch to creative projects. 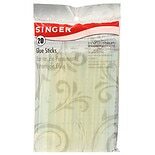 Adhesive remover can remove unwanted tape, labels and stickers without causing damage.